Be sure to let us know your choice of finish. See photos for options. 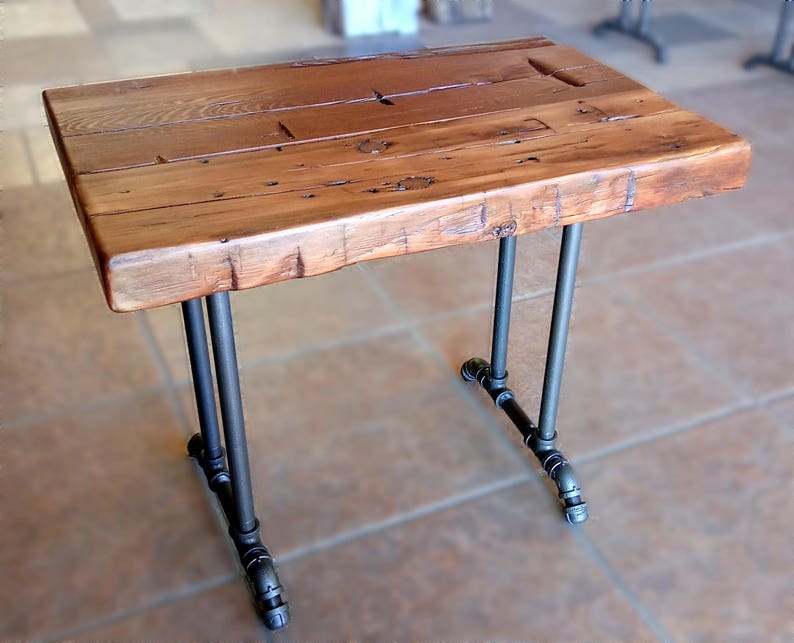 Reclaimed wood end table, bedside or accent table made from authentic, hand-hewn, salvaged wood from log cabins and barns in the upper Midwest. 2) Choose your leg style from the drop down menu. Read more about the different leg styles below. 3) Choose your finish color. Use the personalization field to request your desired finish. The standard finish depicted in the primary photo is called vintage maple, which plays beautifully with the natural variations of the wood. I am happy to custom mix a shade to work with your own furnishings, floors, woodwork etc... Please inquire if interested. 4) Our standard height is 30" tall, dining room table height. I am happy to make them any height you would like. Just make a note in the comment section of your order. There is an extra charge for tables taller than 36". Please inquire if interested. Choose either H-Style or Angled Feet pipe style. The feet on the legs have a spread from 6 to 16" depending on which one you choose. Please specify in the Leg Style Variations box at the top. The bottom of all the pipe legs has a cap that will allow you to adjust individual leg length to accommodate uneven floors. The leg standard color is a finish called dark hammered bronze. We also offer Black. Make a note when ordering if you would like black legs. Will adjust around 3/4", perfect for uneven floors or minor adjustments. Hairpins legs without adjustments are hard to keep flat, these will eliminate uneven or out of balance tables. The leg standard color is a finish called dark hammered bronze. We also offer Black and antique Gold, make a note when ordering if you would like one of these two. This table will ship disassembled via FedEx for a flat $49. Hardware is included and holes are pre-drilled. Assembly is simple with a Phillips screwdriver. This lumber is trimmed from massive hand-hewn beams salvaged from old barns in Wisconsin and Iowa. Amish crews disassemble the barns and salvage as much as they can. Most of these barns were in use for over 100 years before being obsolesced by modern farming practices. They saw farming change from horse power to diesel power. As the culture changed so too do the buildings that support it. This wood was cut from old growth trees in the 19th century by hand saw and ax then shaped by hand with adzes and muscles. I try to present as much of that old had effort as I can. The wood in these boards must be as old as this country. 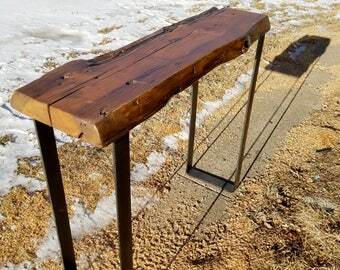 Reclaimed Wood Console Bar Counter Height Table with Natural Edge and Industrial Pipe Legs - Ready to Ship!